Top Five Northern Michigan Towns to Visit for the Holiday Season, Tuscan Strata Recipe, and a BOGO! The beauty of owning your own business is, you guessed it, you’re the boss. That statement can be weighty or it can be freeing. Let’s stick with the freeing part. When I bought my Bed and Breakfast with my husband, it was so I could cook. I love the hospitality and business end of it as well, but cooking was always the premise for me. Prior to my Bed and Breakfast world, I loved cooking gourmet style dinners for my family and friends. Now I had to transition my recipes to breakfast. How many ways can you make eggs? Actually, a lot, thank goodness! Because, here’s the thing. I get so restless making the same dishes. Eggs are so versatile. Poached, souffléd, scrambled, over easy, sunny side up, soft boiled, hard boiled and so on. I particularly like to be creative with quiches, tarts and strata. Then adding a million ways to serve fruit and bread courses and creative garnishes, and you’ve got yourself an empty canvas waiting to be filled. Scatter half of the bread in a buttered 9 x 13 baking dish. Sprinkle with 3/4 Cup of Fontinella and 3/4 Cup Goat cheese. In a medium pan, saute’ the mushrooms in butter and in a different pan caramelize the onions in a good olive oil. Spread the vegetables on top of the cheese and bread. Top this with the remaining bread. Whisk the eggs, Half and Half and salt together and pour mixture on top. Sprinkle with the remaining cheese and sun dried tomatoes. Cover with foil overnight. Preheat oven to 325 degrees. Uncover and bake for 40 to 50 minutes or until slightly puffed and just set. Let rest 10 minutes before cutting and serving. Tip: Have fun with this strata. Make different combinations of cheeses and vegetables. It is a new dish every time! Charlevoix – Straddled by Lake Michigan and Round Lake, Charlevoix is alive at holiday time. The cute shops, restaurants, and craft breweries are just waiting to be explored by you. Small businesses are alive and well in this quaint town. Warm yourself by a fire and visit with friends at the Cantina or check out That French Place where the owners treat you like family. Want to see a castle? Castle Farms offer tours of its beautiful structure all lit up for Christmas! Admire the lighthouse and channel to Lake Michigan, it’s breathtaking. East Jordan – Located on the South Arm of Lake Charlevoix, East Jordan has a lighted Christmas Village that you can drive through. Visit the restaurants and shops in this charming town. If you are in for adventure, visit Jordan Valley Outfitters and they will take you Winter Rafting down the Jordan Valley River. I’ve done this and it is the most breathtaking and beautiful sight. Dress warm! Petoskey – Walk through the Gaslight District and be mesmerized by the Norman Rockwell type of small town at holiday time. On the shores of Lake Michigan, the town is lit up at every light post. 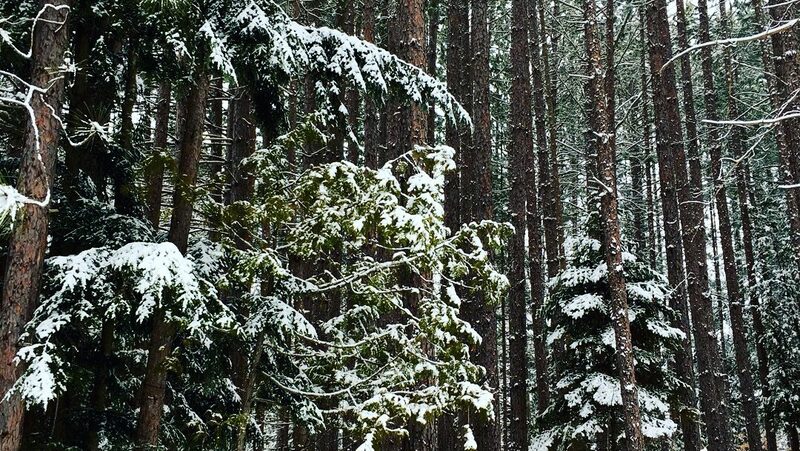 Add snow and you will gravitate towards the local Roast and Toast for a hot chocolate (or my favorite, Almond Joy Mocha). Rudbeckia Farm and Winery is having a Holiday Cookie and Wine Pairing December 15 and 16. I love this idea! Wine goes with everything, right? Boyne City – On the shore of Lake Charlevoix, Boyne City is bustling at holiday time. Can you picture yourself dining at a European Bistro with a roaring fire outside and beautiful Lake just beyond that? Cafe Sante’ is a favorite of mine. Go on a Saturday night, and there is always great live music. If skiing is your thing, Boyne Mountain Resort is right outside the city. 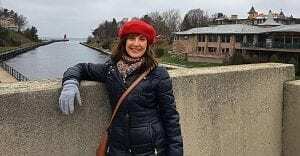 Bay Harbor – Nestled down on the shores of Lake Michigan between Charlevoix and Petoskey is a little village called Bay Harbor. The lights here are amazing and the shops and restaurants are high end. A new addition to Bay Harbor is the Great Lakes Performing Arts Center. On December 21, there will be Handel’s Messiah performed by The Great Lakes Chamber Orchestra. My husband Phillip (wearing the other plaid shirt!) 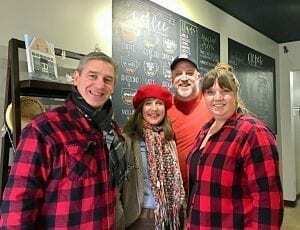 and I visiting the owners of That French Place for Charlevoix’s Hot Chocolate Competition – which they won. We are offering four BOGO’s (Buy One, Get One) for the first four months of 2019. Put them in your calendars! To get this special offer, call 231-588-6304. Enjoy the Holiday Season with all the festivities. 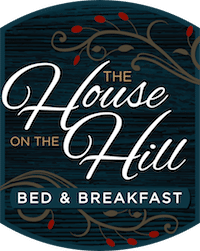 All of us from The House on the Hill Bed and Breakfast send our warm wishes to you and yours! 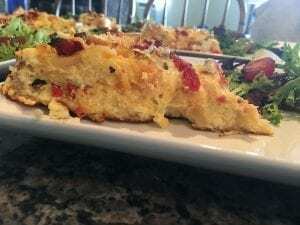 Top Eight Restaurants in Northwest Michigan for Valentine’s Weekend, A Fruit Dutch Baby Recipe, and Two BOGO Weekends Left!